Hello my little festive crafters. Today’s post is going to be photo heavy, Lots to look at. 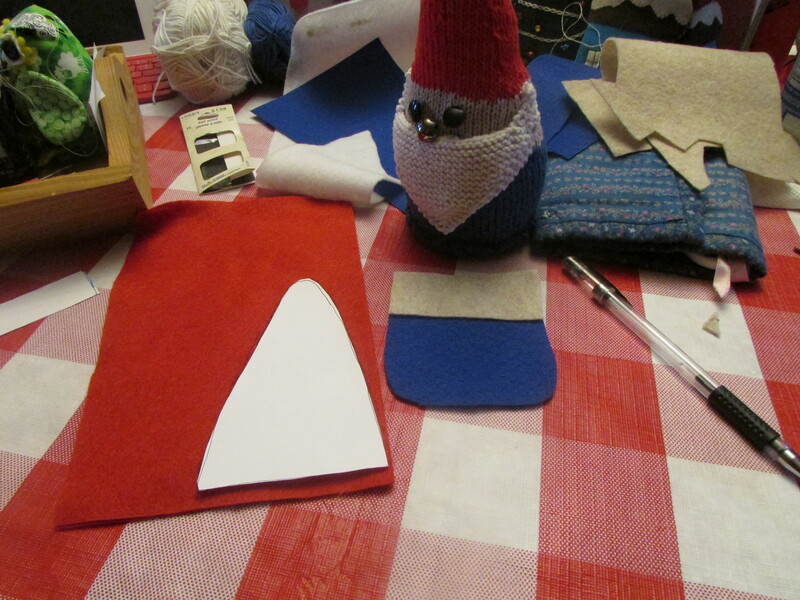 I love using felt for crafting. It is such a versatile medium, has great colours, requires only basic skills, is inexpensive, and makes you look like a crafting genius. 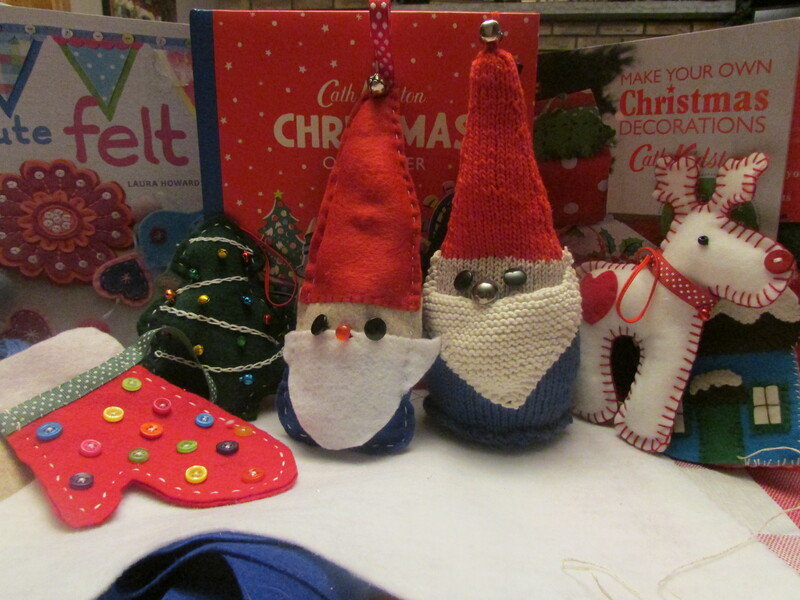 I made these little felt guys a couple of years ago. Miss Murfin and I sat around the kitchen table for a couple of hours and had a blast. She created an entire set of Charlie Brown character Christmas ornaments, while I went for the more traditional route. None of these shapes are difficult. I drew them free hand, but if you are not too confident with a pen, you can trace a cookie cutter or a colouring book. And of course the internet is full of templates. 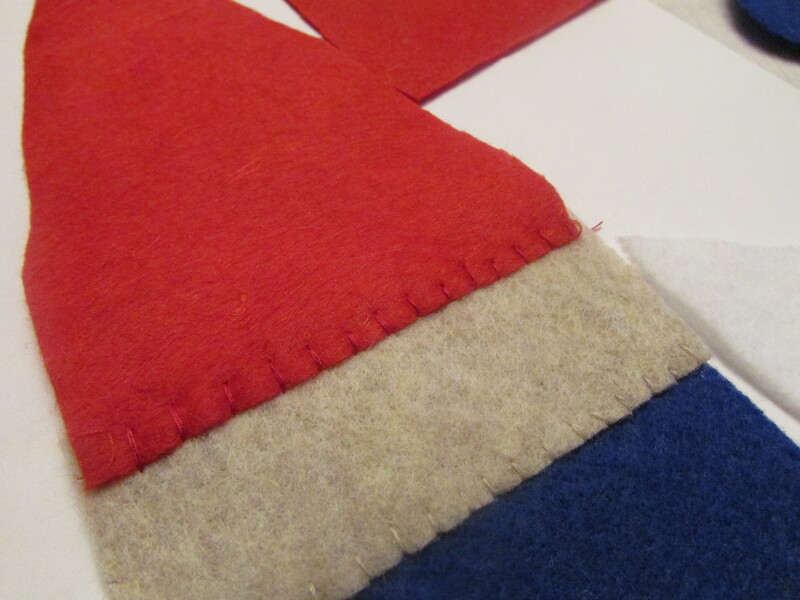 One of the glories of felt is that is doesn’t fray so you can just cut on the lines you want and sew together. If sewing intimidates you glue works too. One of my favourite felt designers is Laura Howard. 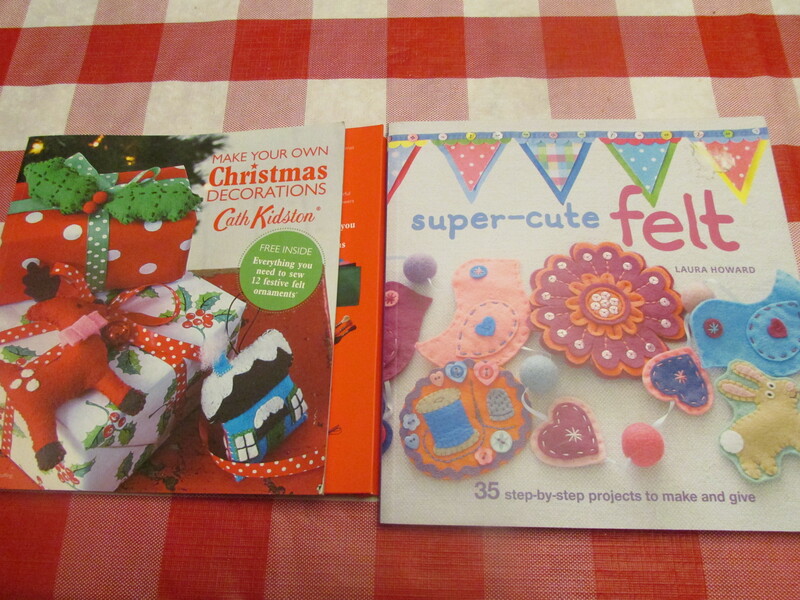 Her book “super-cute felt” is pictured on the right, and her web page is http://bugsandfishes.blogspot.ca/ I learned a lot of my basic techniques from her and still want to try more of her designs. On the left is a book + kit that Miss Murfin gifted me. 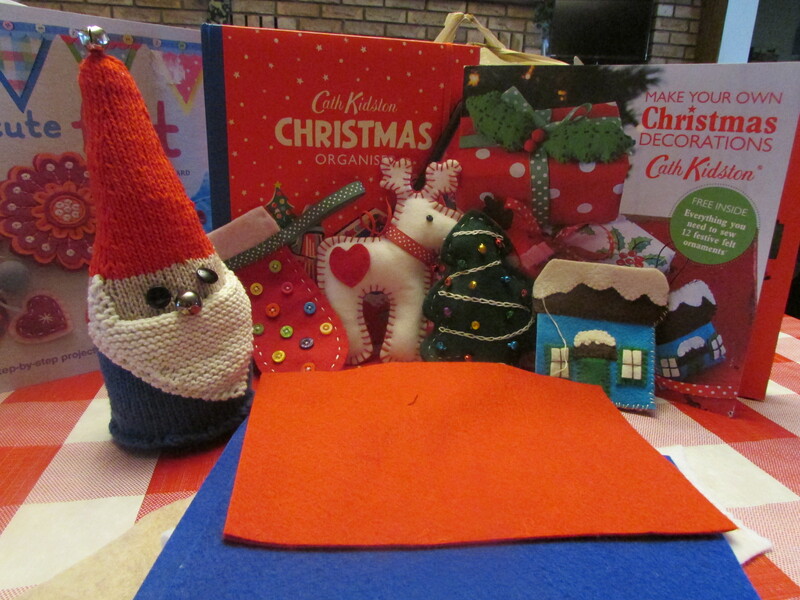 “Cath Kidston Make your own Christmas Decorations” is a favourite and all the supplies were included. I still have more of those to finish. But today I thought we would make a replica of Geoffrey! As I said above I like to find a shape and free hand the design. Felt is very forgiving and if in doubt add a little extra and cut it down as you go. Geoffrey is basically 3 blocks of colour with only a little shaping. 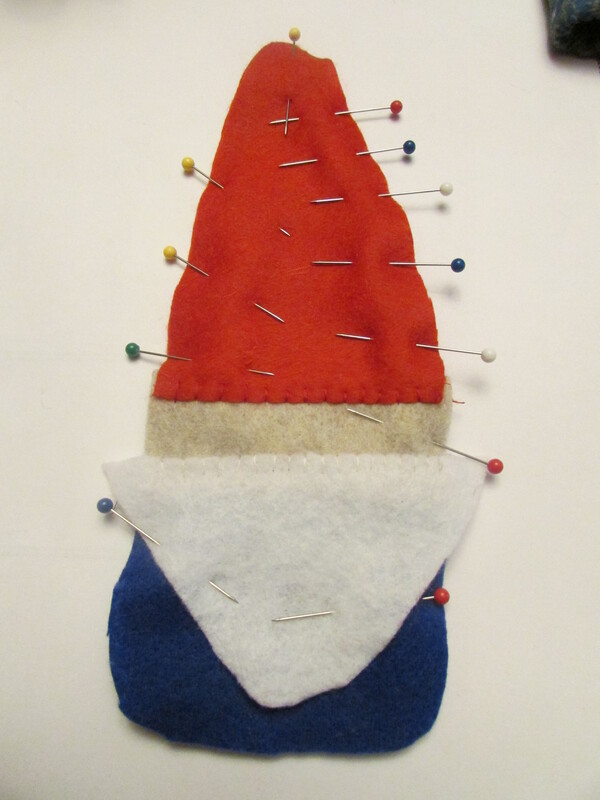 I added a little to the top of the face over-lay piece and the bottom of the hat so I could join the pieces together. I layered them with the hat over the top of the face colour. Then I add all the elements together. using my eye to keep it looking even. I laid both sets of pieces together to make sure both front and back will be the same length. 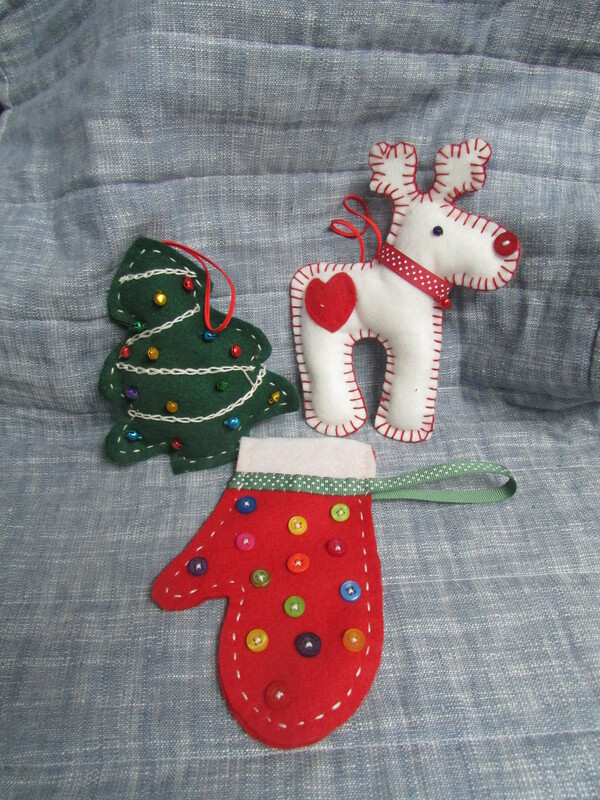 Also, as I finish sewing each piece I just do a couple of back stitches on the wrong side – they will be on the inside. 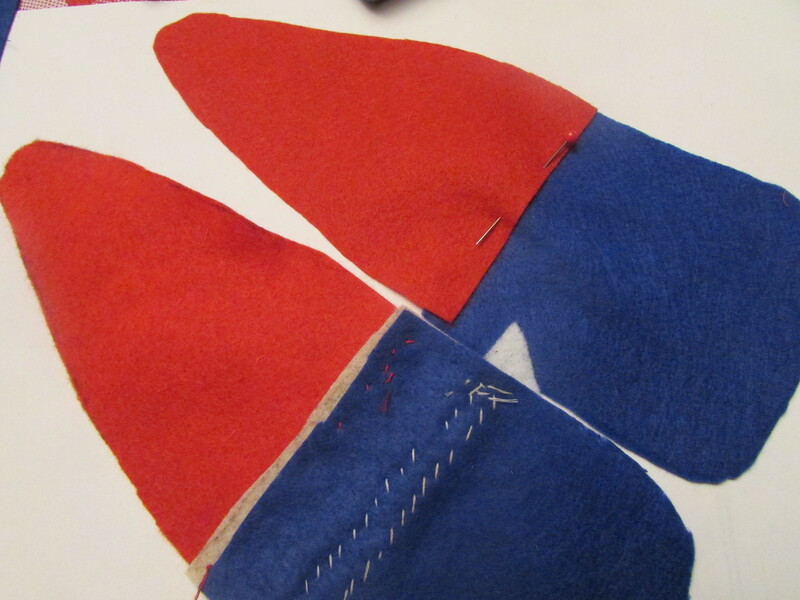 After have both sides assembled and I add the eyes and nose, I pin them wrong sides together to sew the edges. OK in truth I forgot the add the eyes at this point and had to sneak them on at the end. It would have been EASIER to add them now. 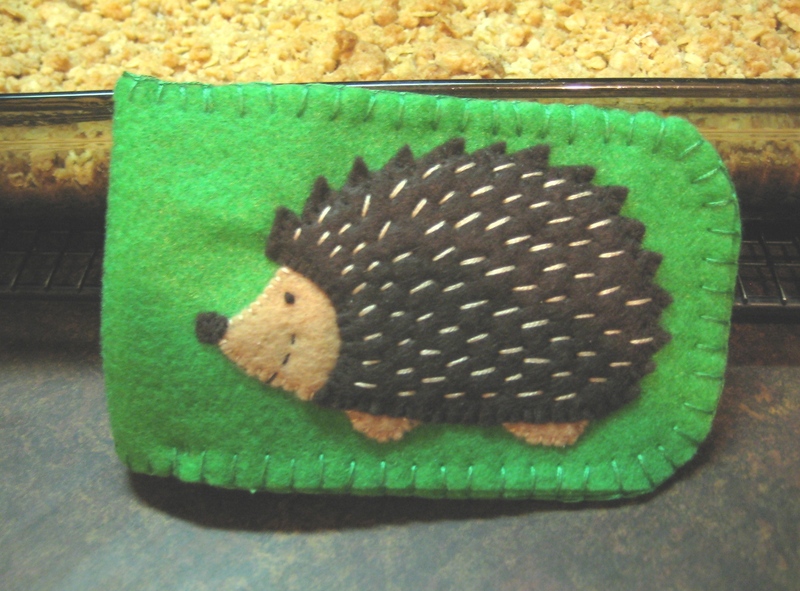 I decided to use a running stitch around this guy. He is going to hang on the tree so will not be getting handled too much. 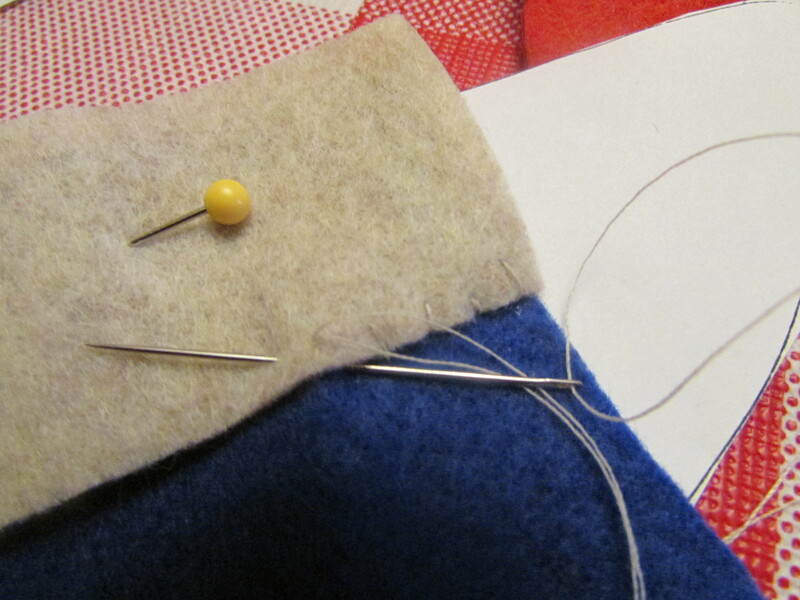 If I was making a toy or a jewelry, I might use a blanket stitch to close up the edges. Before I closed him up I added a bit of stuffing, but not too much as felt will rip if you over stuff it. And there he is ! Geoffrey 2.0 along with his pal Geoffrey the 1st. Of course Christmas is not the only time of year that felt is great. 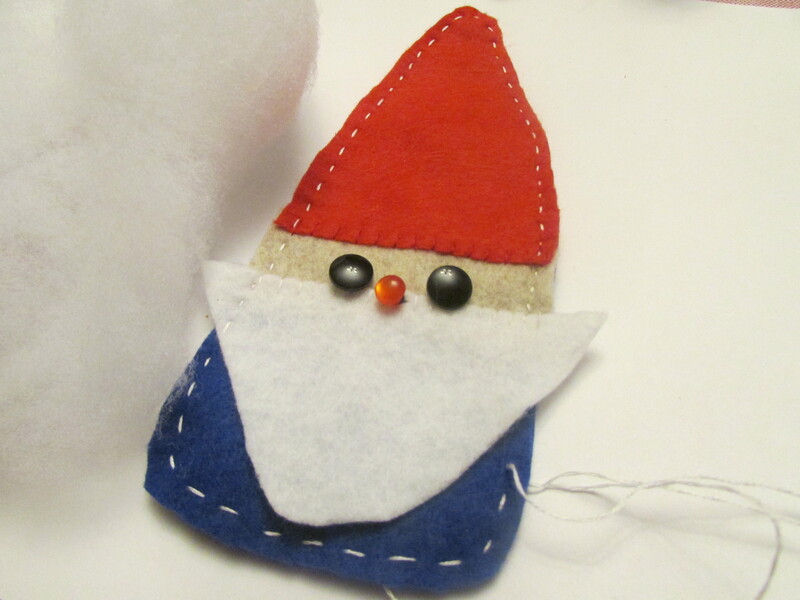 Laura Howard has a great design in her book Super-Cute Felt that I HAD to make. A Hedgehog Hill mascot of course!